I have set a goal for myself over the next couple of weeks to play catch-up with my Julep boxes. I have a HUGE pile of them sitting beside my lightbox that have been looked at, ooooh-ed over, and then left. 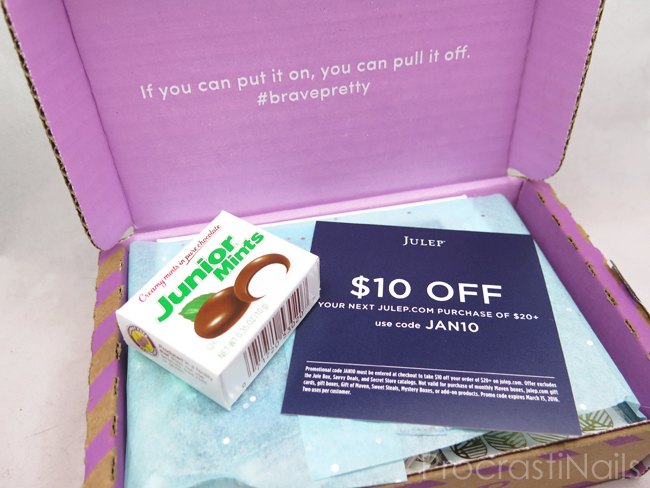 For some people that might be a sign that they should stop buying Julep boxes and go on a no-buy until they catch up, but not me! Haha. I take it as a challenge! Gotta get them done before the next box arrives! Will I make it in time? Only time will tell! (But probably not). ANYWAY, first up we're looking back at the box I got this January. I'm pretty sure this was a box I fully customized as I wasn't feeling many of the colours in the main collection. I ended up with a holo, a textured semi-sheer white and a new base coat along with some decals. Pretty good selection in my opinion! Check out the full unboxing and swatches below! Free gift of candy and (now expired) coupon code! Ew, junior mints. Am I the only person who hates these things? 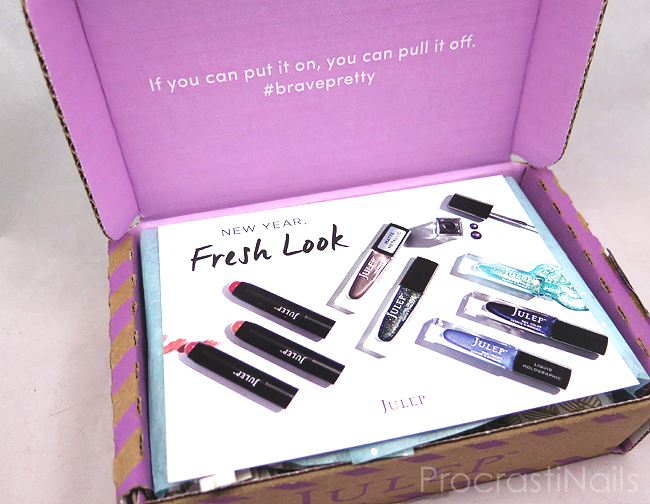 For my box this month I did a lot of swapping from the original box Julep arranged for me... I put in one polish from the new line (Tali), and then selected a textured polish I've had my eye on for a while (Elsa) and threw in Julep's Oxygen Bonding Base Coat for my third item. The It Girl box I customized from also included some nail stickers, so I went with the Golden Angle ones. Let's get into the reviews! Unfortunately I haven't had the chance to try this base out yet, but I'm generally a fan of Julep's nail treatment polishes and I'm also a fan of bonding base coats from other brands, so I'm hoping those two things will come together to make this an amazing bonding base coat... When I do get a chance to try it out I will do a full review and let you know! I haven't gotten a chance to try these out yet either, though I have to say I'm a bit skeptical of how well they might or might not work... The fact they are pre-sized for a full nail cover makes me nervous that if my nail isn't the exact size they won't look good, but I'll have to leave testing that theory out for now until I have time to sit down to do a mani with these. 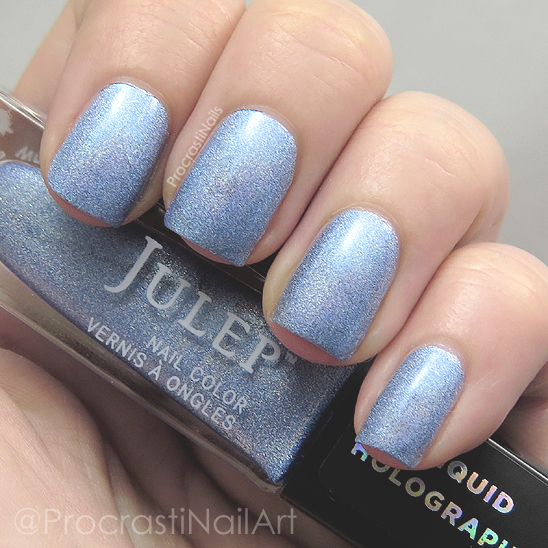 Julep Tali isn't the first holo I've bought from Julep, but it's the first one I've actually tried out! (Yeah I know, I have a huge backlog of polishes to try!) And I have to say, I'm pretty pleased. 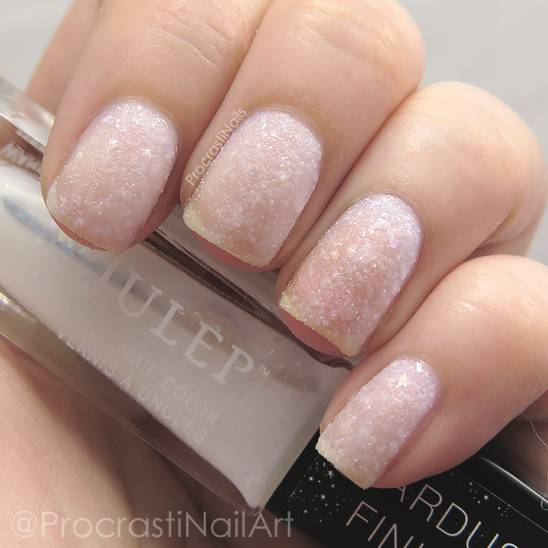 I was skeptical when Julep started coming out with holos on a moderately regular basis last year but now that I've tried one I can say they're doing a pretty good job! So pretty! 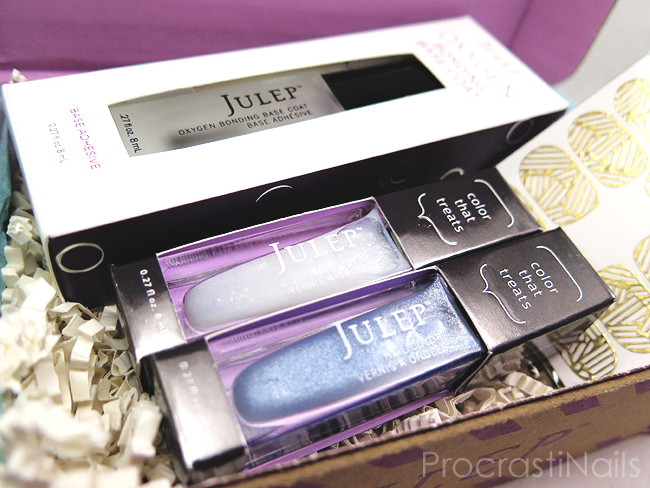 Good job, Julep! 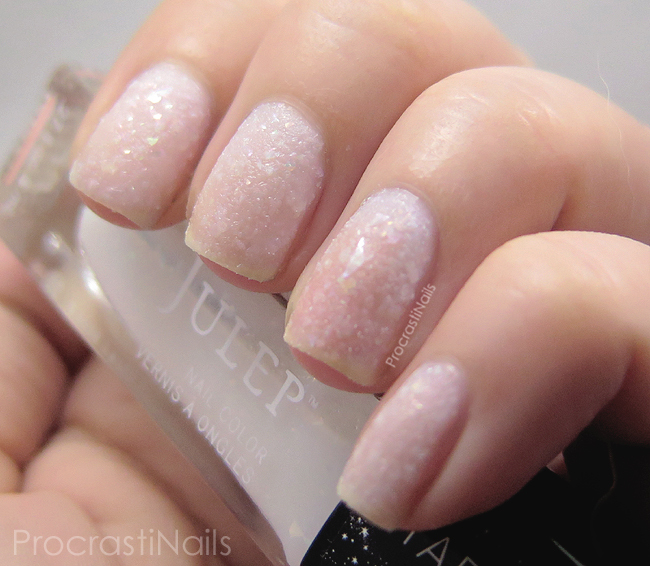 The other polish I picked up is one that was released last year named Julep Elsa. Any guesses why they went with that name? Haha. 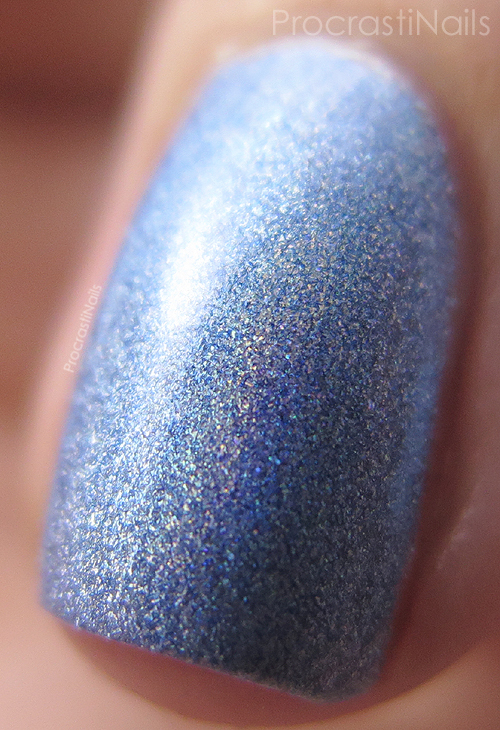 This one is described as a "snowdrift iridescent stardust" and I really love how dreamy it is! It's a sheer white textured polish with iridescent shards scattered throughout that catch the light in a subtle pink-yellow-green shift. My mom said it looked like it would be good for a slightly edgy bridal look, and I would have to agree! It's soft and simple but has that extra 'something' to it! I bought this expecting to use it for some winter nail art, but I missed that ship by a few months. Oops! I'm happy with each and every thing I got in this box, even if I haven't actually tried it all out. Both of the polishes were unique and lovely, and I'm looking forward to getting more wear out of them! Some nice items you received inside this box! I'm not so sure about Elsa - maybe I'd like it better over a base polish - but Tali is really beautiful! Elsa is an interesting polish, not sure I would rock it. I can't wait to see you try out those wraps because they are super pretty! I was thinking the same as Kerry, Elsa may be more me as an effect coat. I love Tali though. Oh my, Tali is gorgeous! I'm excited to see what you do with the wraps! OK those polishes are wonderful! I love the blue, it's lovely, and I really really need Elsa, it is indeed an awesome edgy wedding polish and I want to play with it! Also, how do they look together? Tali is super pretty! Elsa is definitely on topic with the name, but I don't really like it.